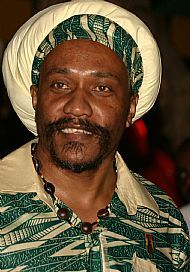 I am a Performance Poet, Author and Ambassador for Rastafari and Shared Histories . I am a Dub poet and a Reggae Artiste with my own band:check out this Gleaner article: "Dub Vijaan" and click here to hear one of our great tracks "Guide I & I". I travel to many countries in the world, but I have many friends in England and Wales, and I have been in the UK to support Black History Month activities since 2010. I am interested in discussing Dub Poetry workshops and Residency opportunities and events across the UK: in Wales, Scotland, Northern Ireland and England as part of my Black History Month Tour 2019. As well as performing poetry, I also promote poetry events and this year the successful "Jamaica Poetry Festival" was staged in August in Kingston, Jamaica. When I travel and do workshops in schools and other organisations, I tell stories about living in Jamaica - as Jamaica became an independent countryand I explain about our shared histories. I use my poems to tell the story. I bring education and entertainment together as "edutainment" so learning is fun and interesting! In my sessions I also tell the story about Africa, where we all came from, and help my audiences to think about our shared history and our shared responsibilities. We listen and learn, and we care and share, and we sing and dance! In Jamaica I introduced a new idea to the Ministry of Education for all schools to work with Culture Agents, so we could make sure that all Jamaican children understood our history and culture. I have worked as a Culture Agent ever since. I also found that there were no books for children to use to study about Rastafari, so I took time out to write and publish my book "Overstanding Rastafari - Jamaica's Gift to the World" and I became an Ambassador for the Parliament of World Religions. Contact Liz Millman at Learning Links International if you would like me to visit your school or organisation - to bring a flavour of Jamaica through edutainment and to learn about Black History - our Shared History. Liz will be happy to discuss possibilities and make the arrangements. or use the feedback from this site. This photograph was taken when Lesley Ward, Head Teacher from Uplands Junior School in Wolverhampton and Liz Millman visited Cacoon Primary School and ASTEP Centre in Hanover, Jamaica, and met Principal Carol Grant and the teachers and children when we launched our "Building Bridges" poetry link.